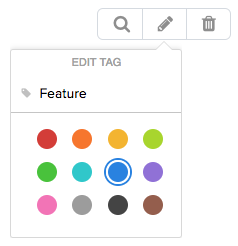 Within Teamwork Projects, you can manage the tags on your site, editing and deleting them, in your site settings. To view the Tags area, click your profile icon in the top right corner of your site, and select Settings from the dropdown menu. Note: Only site administrators in the owner company have access to the site settings. In the Settings area, go to the Tags tab. You will see all of the tags currently on your site, both active and inactive. Note: The number beside each tag shows how many times that tag is being used. If you click on a tag, you will see an edit option appear above the tags list. Click the pencil icon to edit the selected tag. You can edit the name of the tag, or choose a different colour. If you select more than one tag in the list together, you will see the pencil icon change to allow you to merge those tags. Select the search icon on the left to automatically search the site for all items with the selected tag(s). Click the trash can icon to delete the selected tag(s).